Epoxy domed aluminium keychain with 12cm silver ballchain keytag fitting. 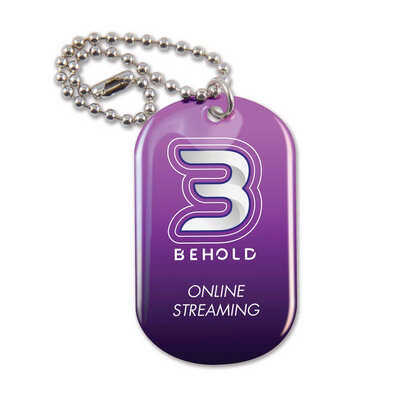 Colours - Custom Size - Tag: 30 x 50mm (LxH) (rounded corners), Chain: 12cm Decoration Area(s) - 4CP Digital Direct with Epoxy Dome Resin : Front - Rectangle 30 x 50mm (LxH) with rounded corners (refer line drawing); 4CP Digital with Epoxy Dome and Laser Engraved : Front: 4CP Digital Direct & Epoxy Dome Resin - 30 x 50mm (LxH) with rounded corners, Back: Laser Engraved - Rectangle 26 x 38mm (LxH); 4CP Digital with Epoxy Dome and Screen Print : Front: 4CP Digital Direct & Epoxy Dome Resin - 30 x 50mm (LxH) with rounded corners, Back: Screen Print - Rectangle 26 x 38mm (LxH). Price includes : 1 Pos 4CP Digital Direct with Epoxy Dome via Air Freight. Setup is included.